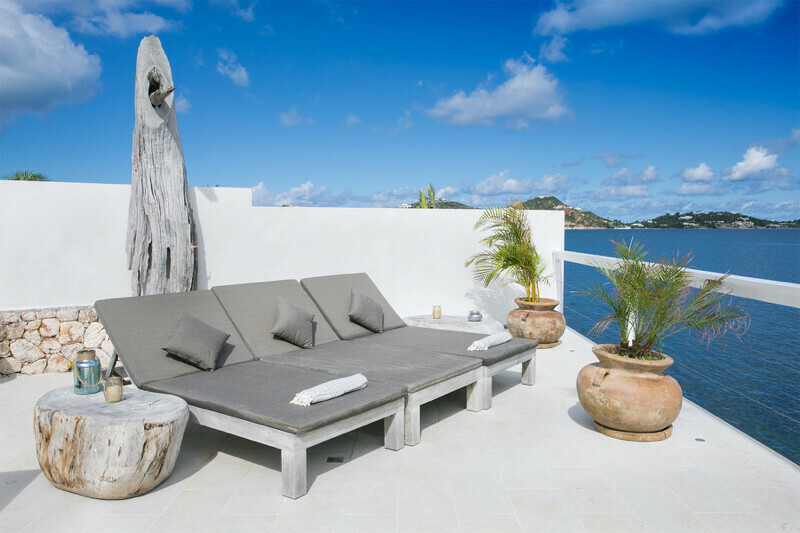 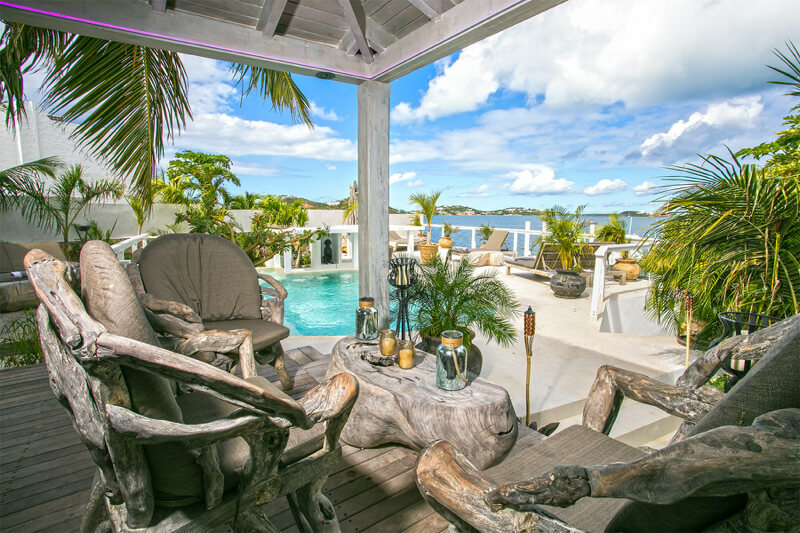 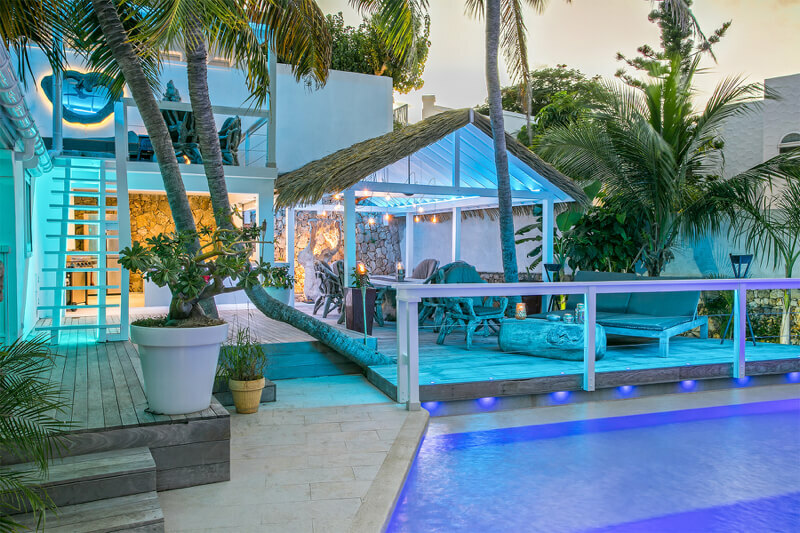 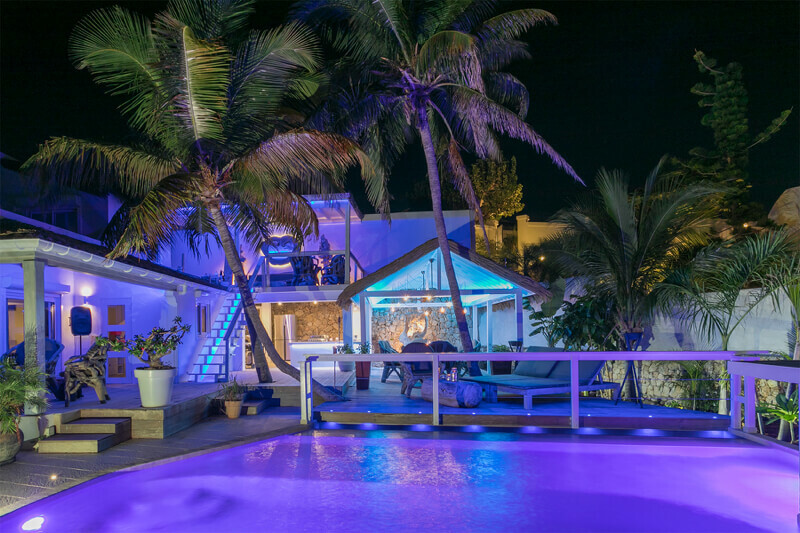 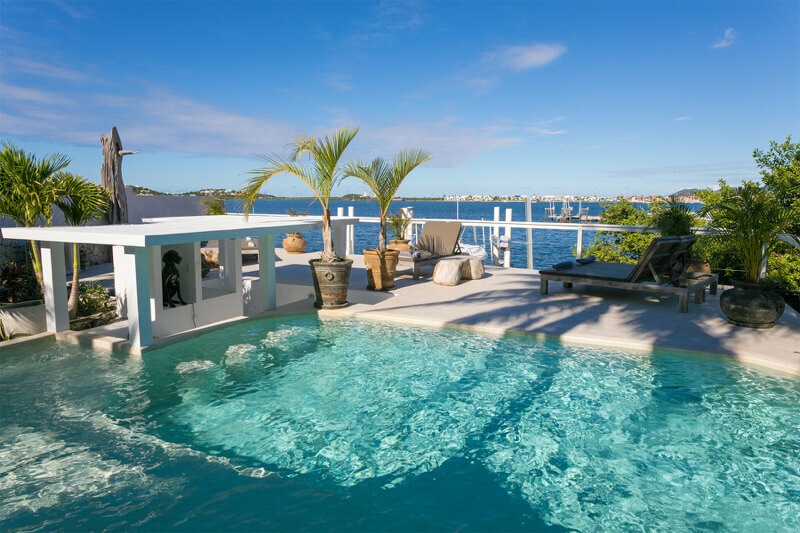 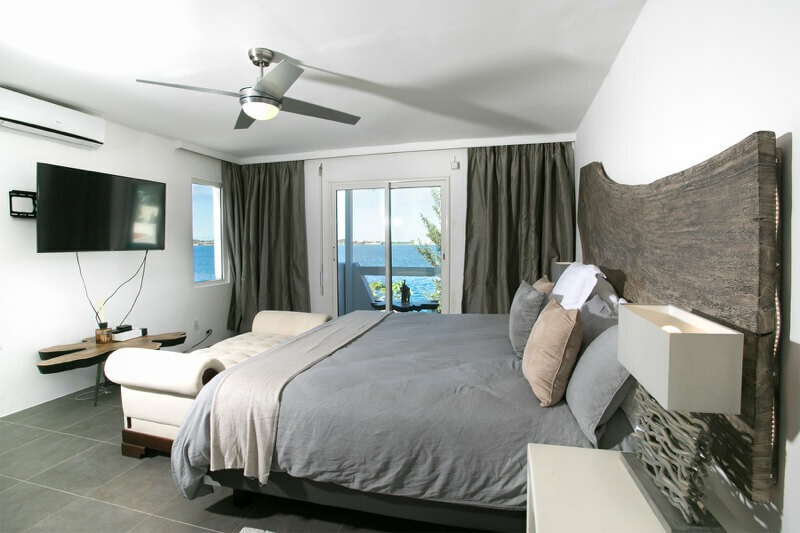 Villa Blue Lagoon is a large tropical Bali style oasis located directly on Simpson Bay Lagoon in Point Pirouette, Dutch St Maarten. 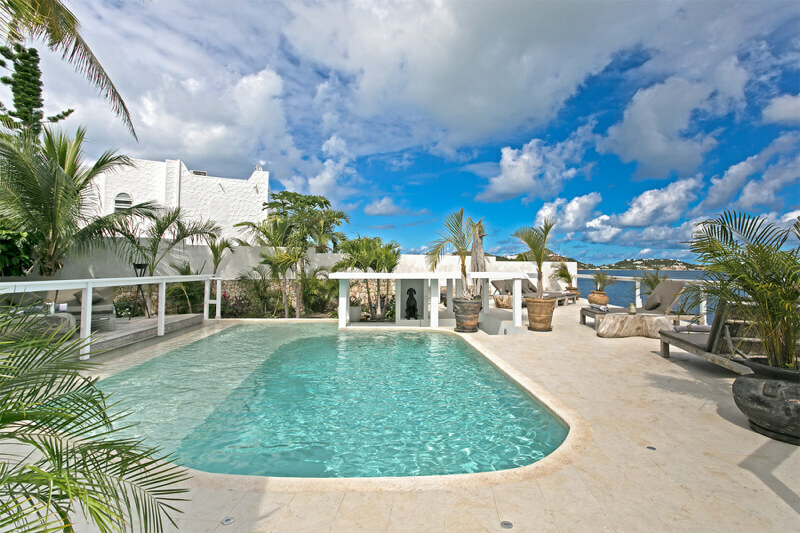 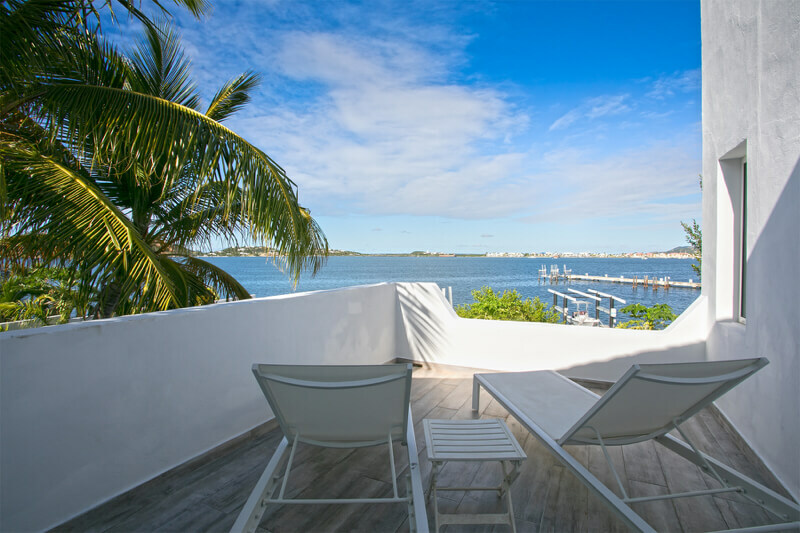 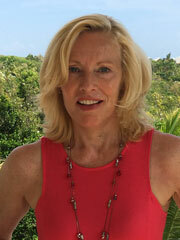 This is a gated community close to the Maho area and the sandy Mullet Bay beach. 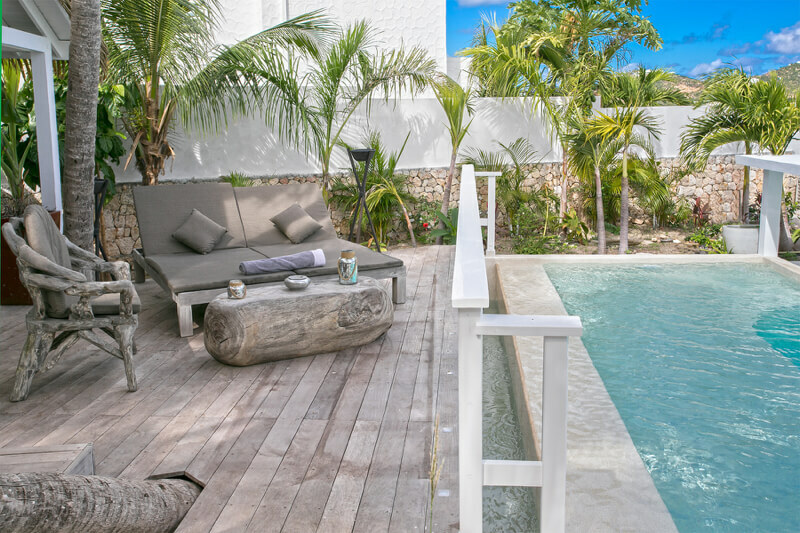 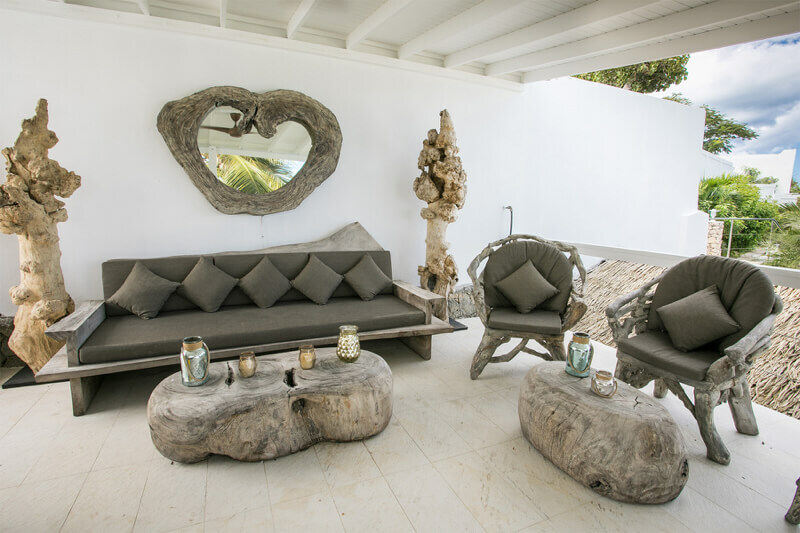 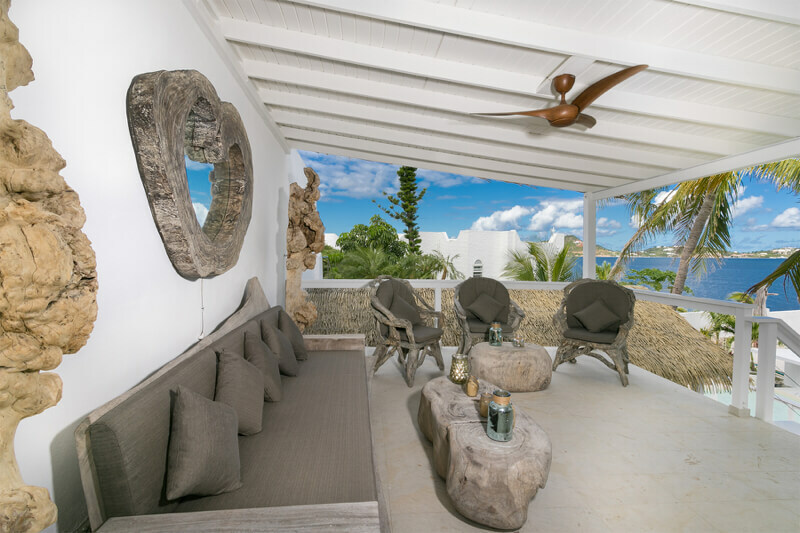 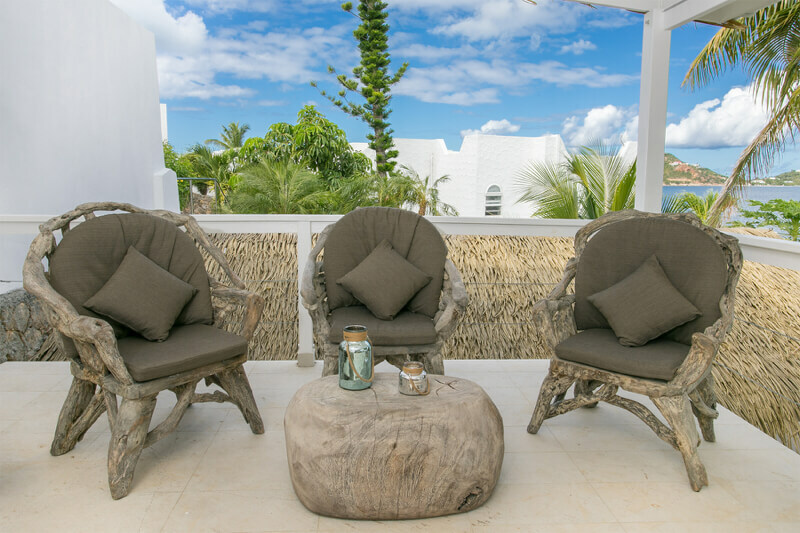 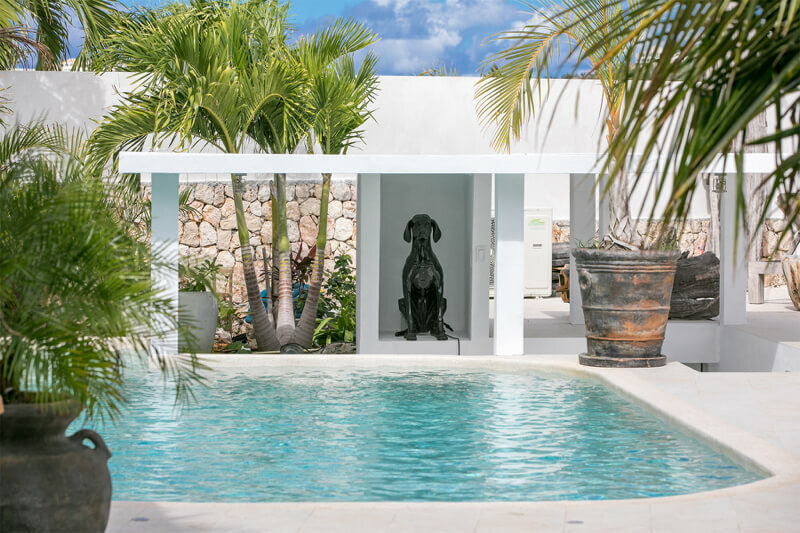 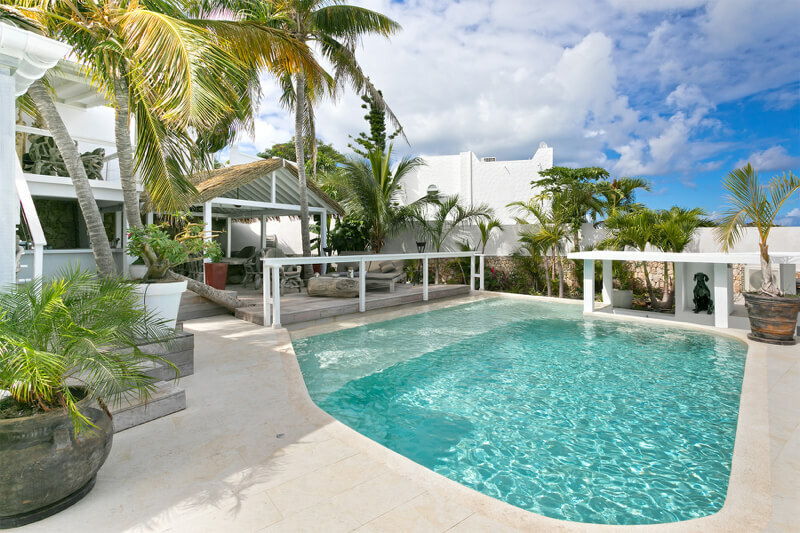 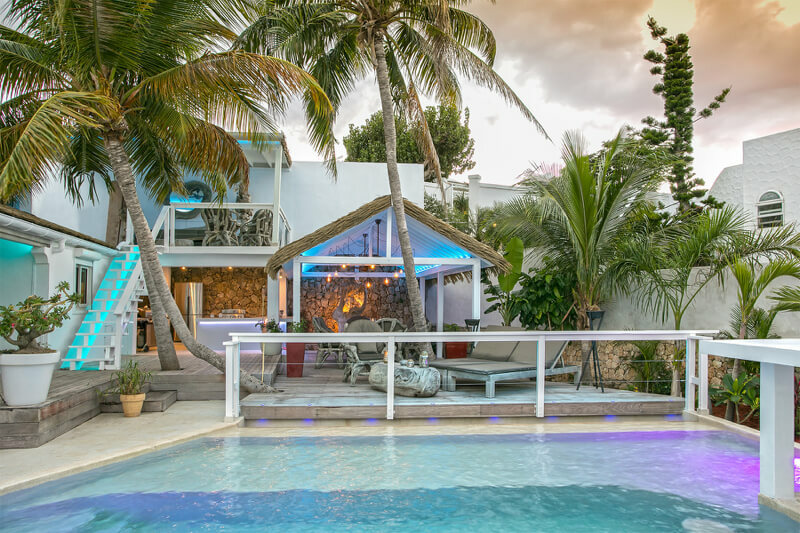 This beautiful fully air-conditioned 5 bedroom/5.5 bathroom villa with a Bali inspired decor is surrounded by tropical gardens and features a gorgeous pool and multi-level deck providing an idyllic setting that makes the most of the perfect Caribbean climate. 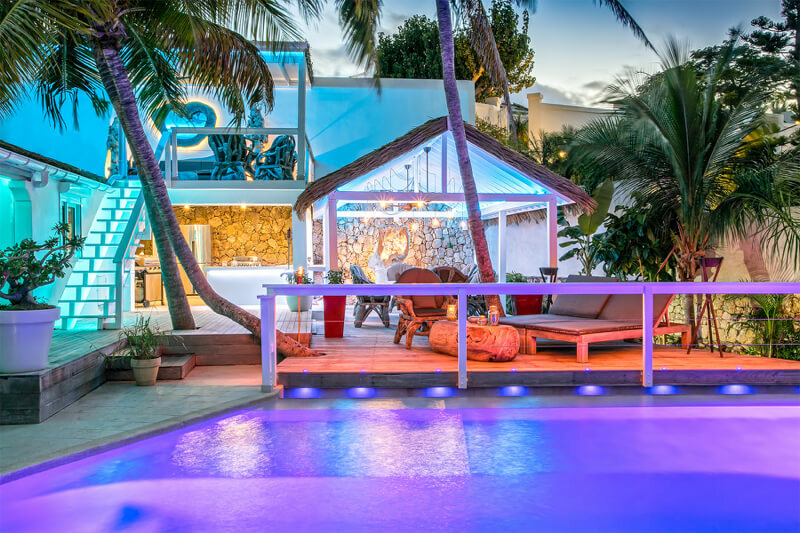 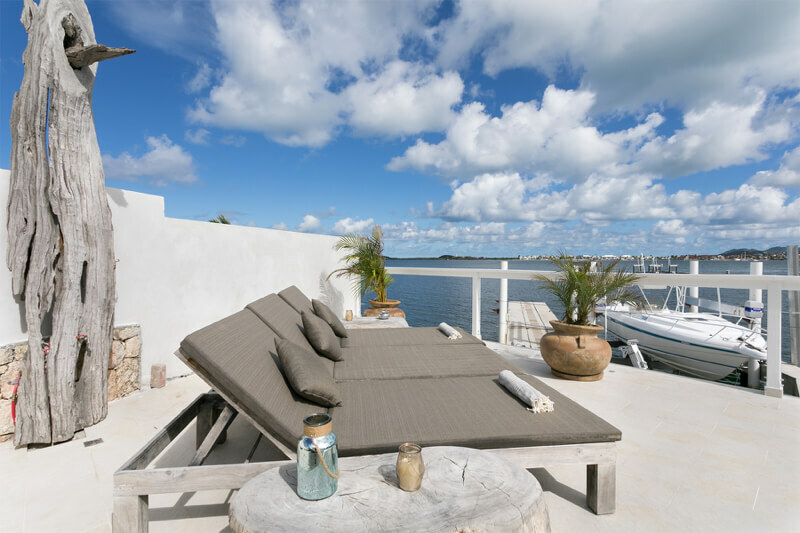 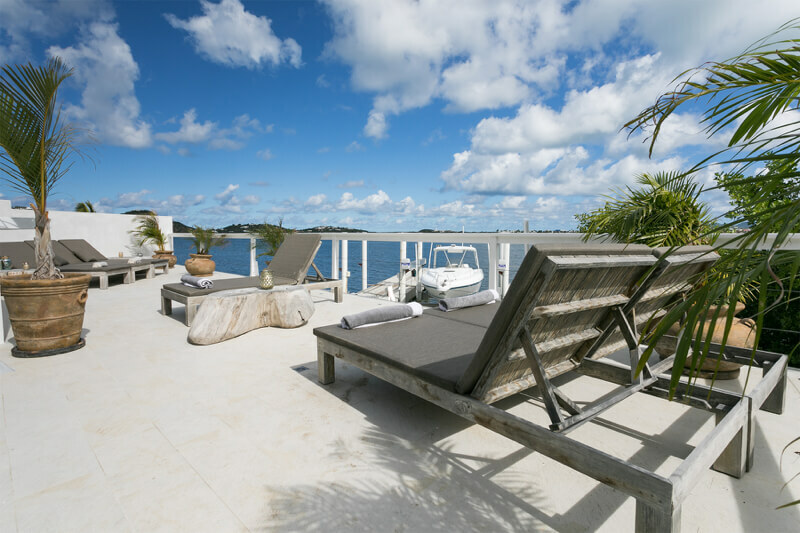 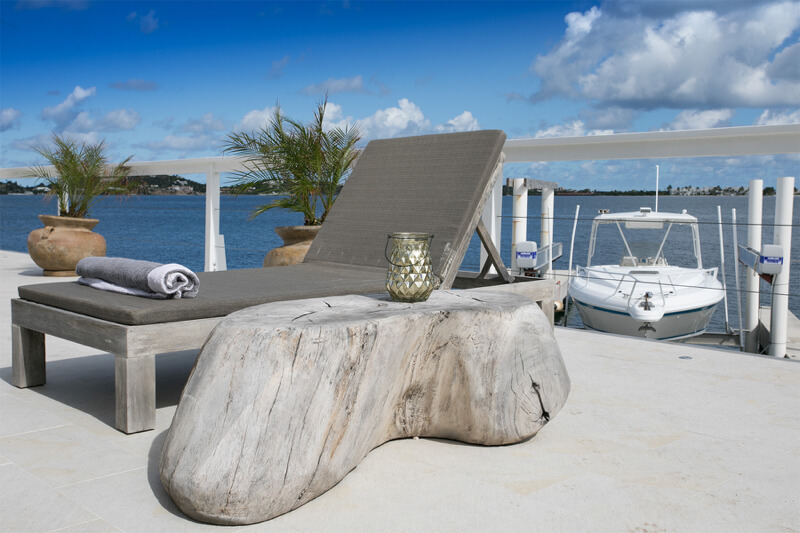 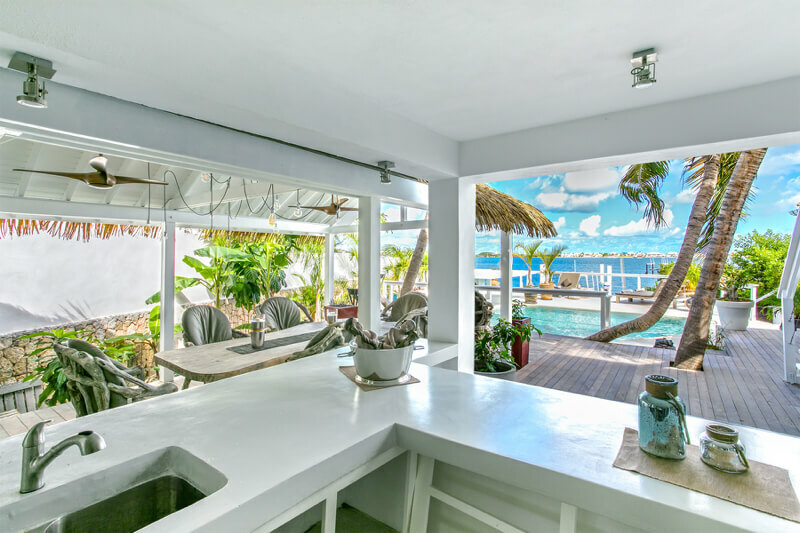 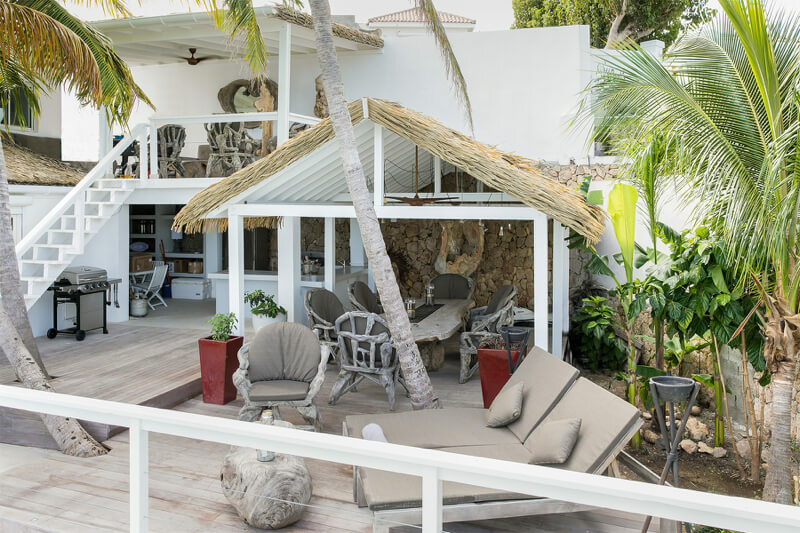 The free form pool has a shallow beach style access and features in-built seats around a sunken wet bar and just steps away from the pool is a teak deck with day beds and tiki torches set beneath two swaying coconut palms. 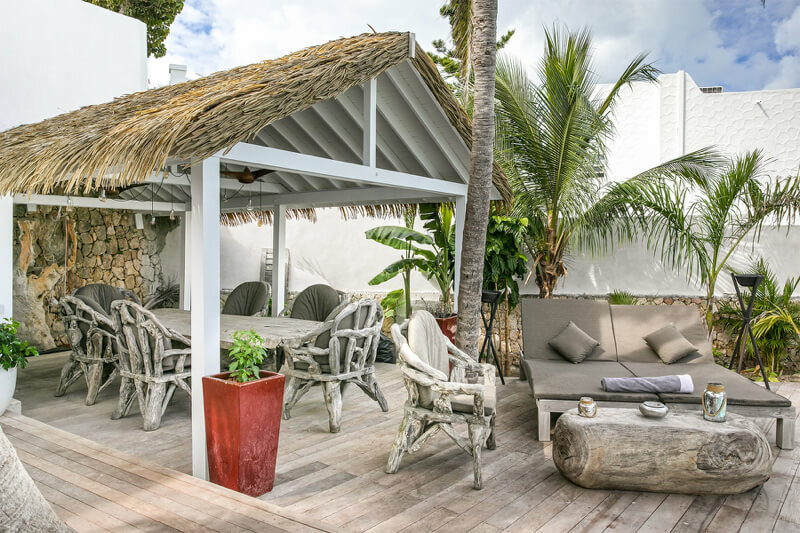 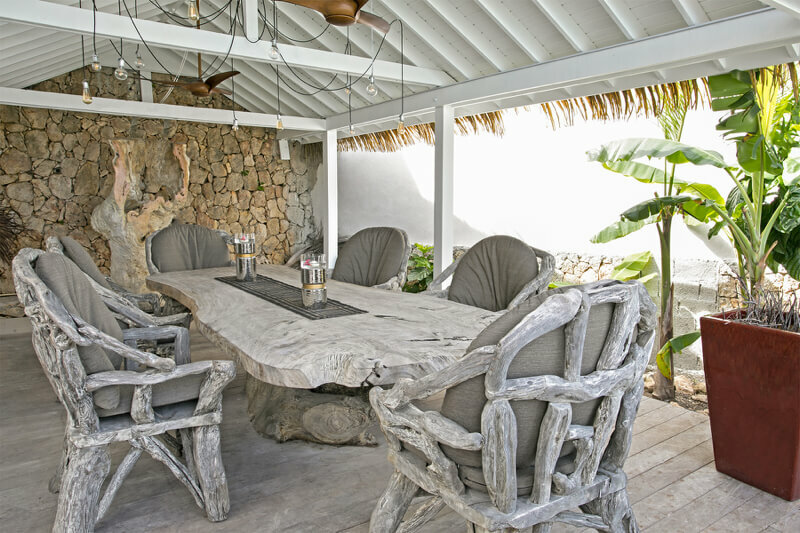 A palm-fronded gazebo houses a lovely shaded dining table of natural wood, perfect for al-fresco dining and is served by a covered outdoor BBQ area with gas grill and wet bar. 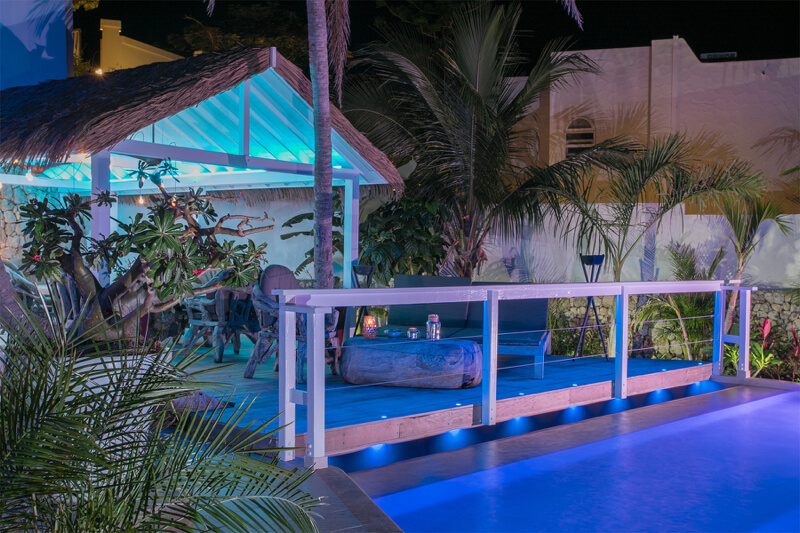 Just opposite the pool is a raised covered deck with an intimate seating area with beautiful natural wood accents and a second lounge area can be reached from an open staircase leading up from the deck, giving a lovely elevated view over the pool and lagoon. 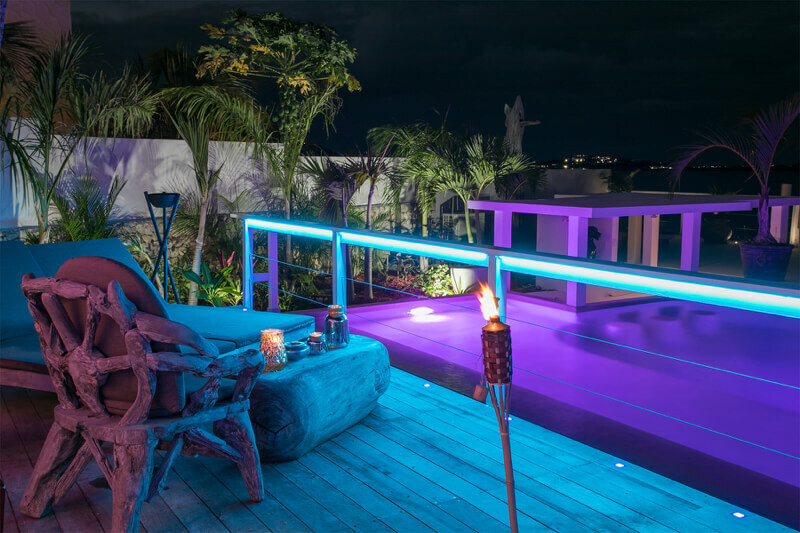 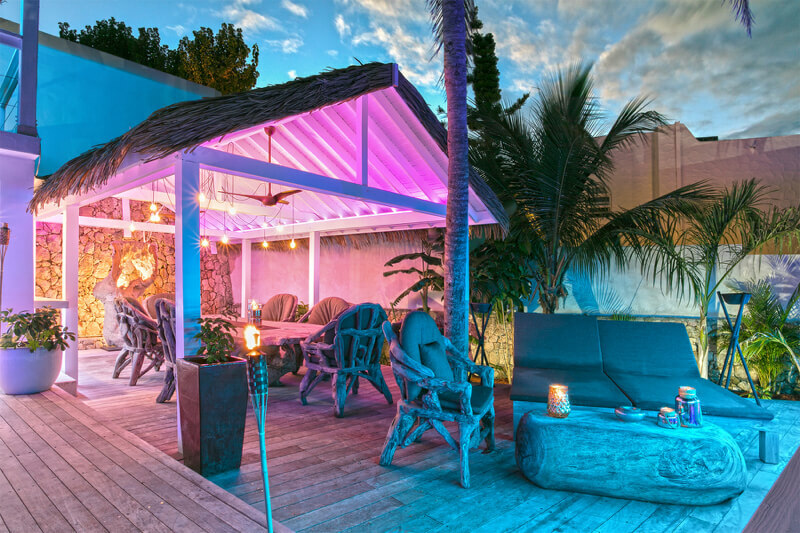 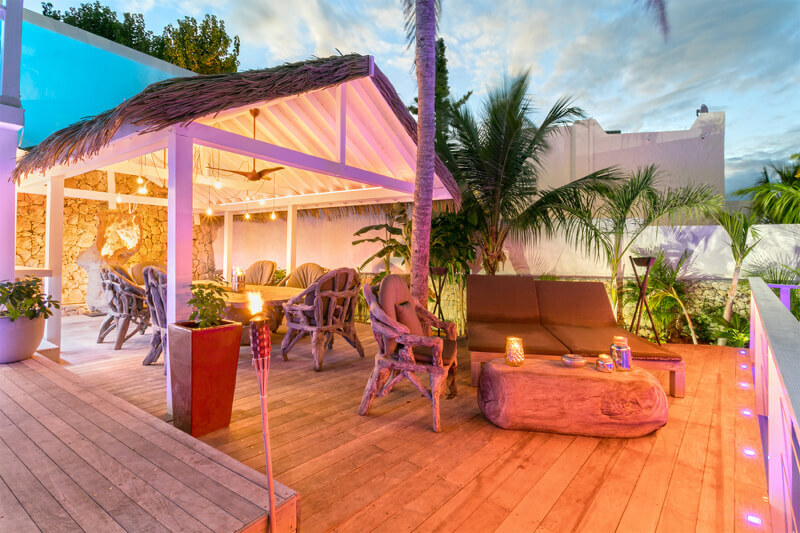 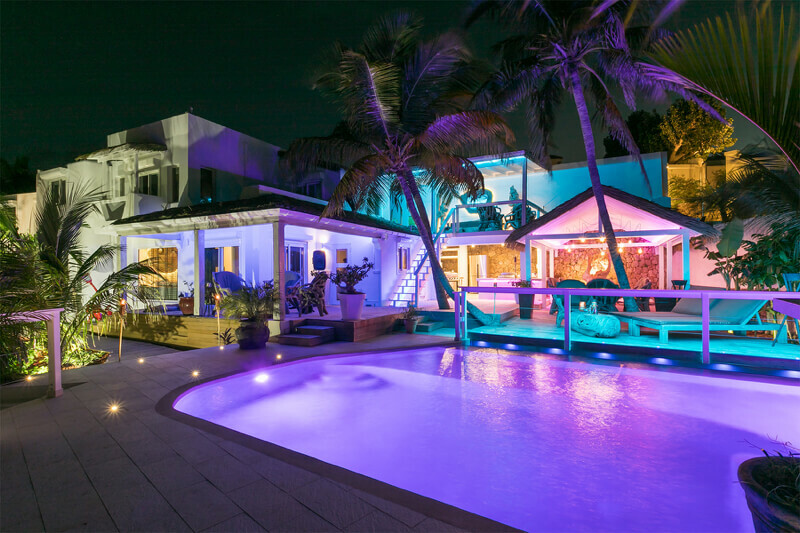 As the sun goes down the whole terrace area is magically transformed by multi-colored LED lighting and tiki torches illuminating the pool and deck and surrounding tropical gardens. 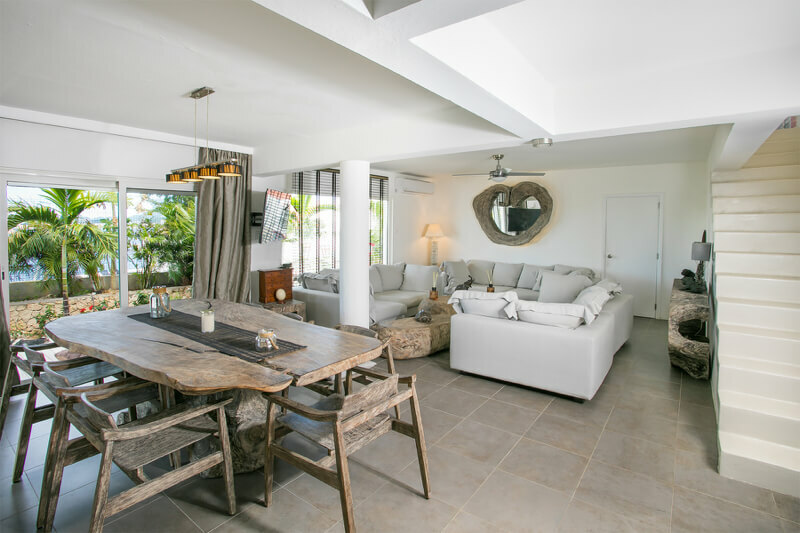 The Bali themed decor continues through to the spacious and luminous interior spaces housing an indoor lounge and dining area decorated with beautiful natural wood furniture, stone flooring, and modern contemporary lighting and a sleek white designer kitchen equipped with top quality appliances. 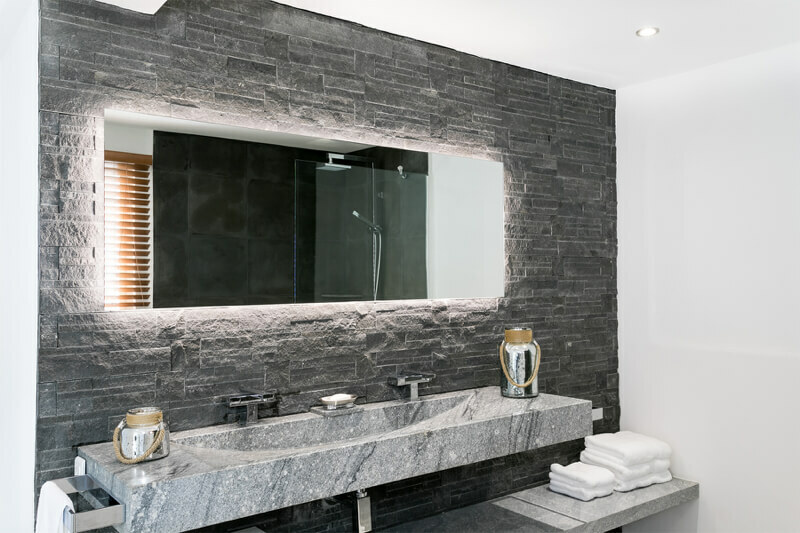 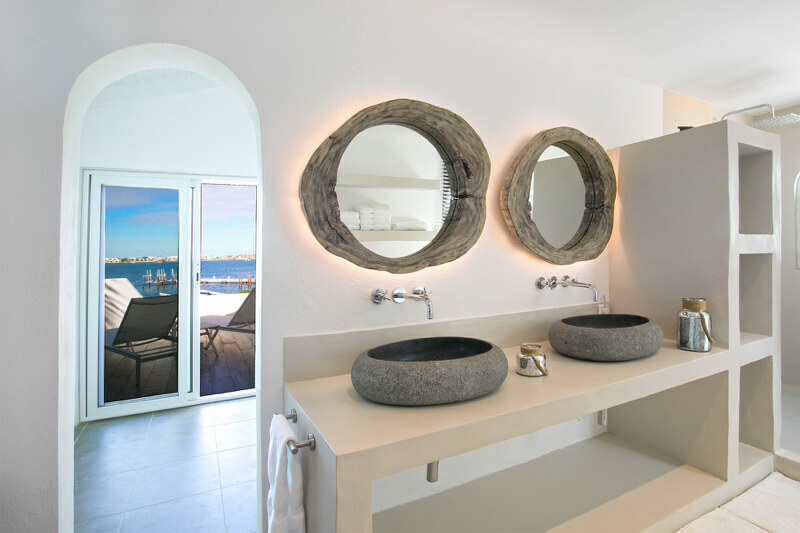 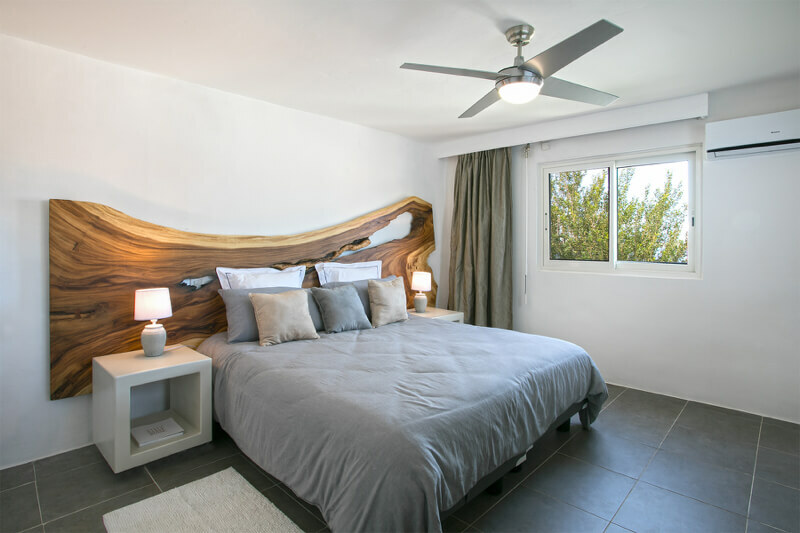 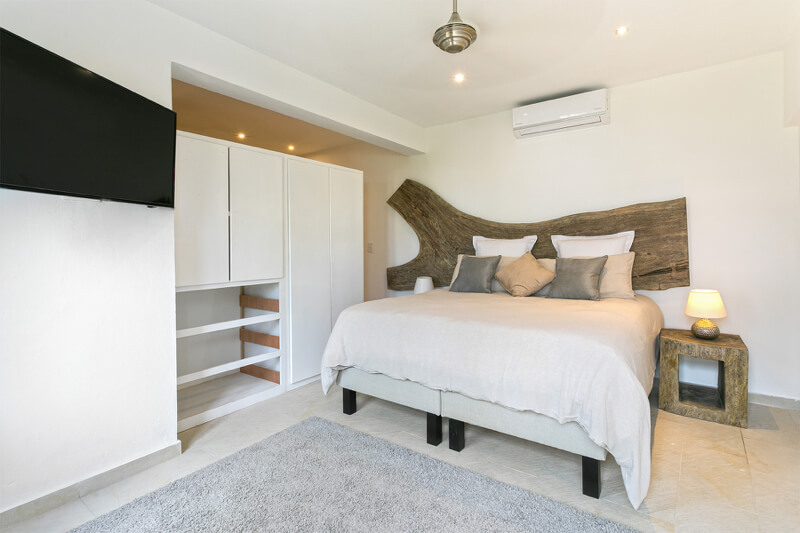 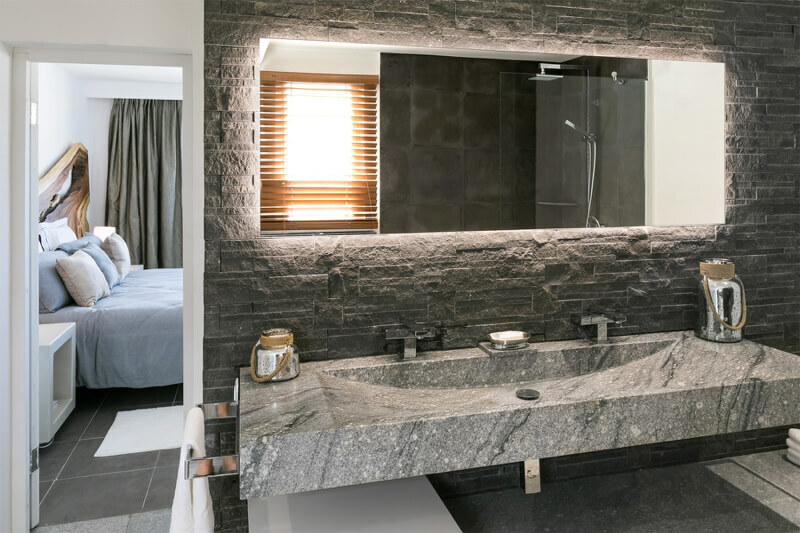 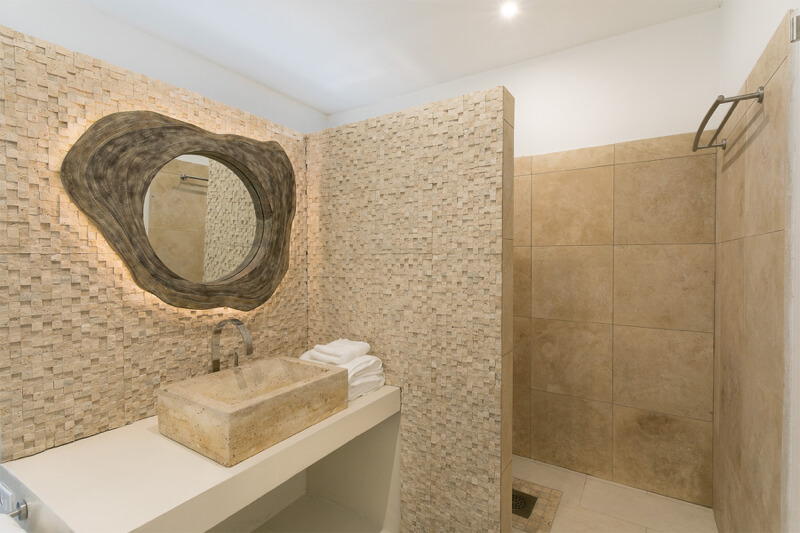 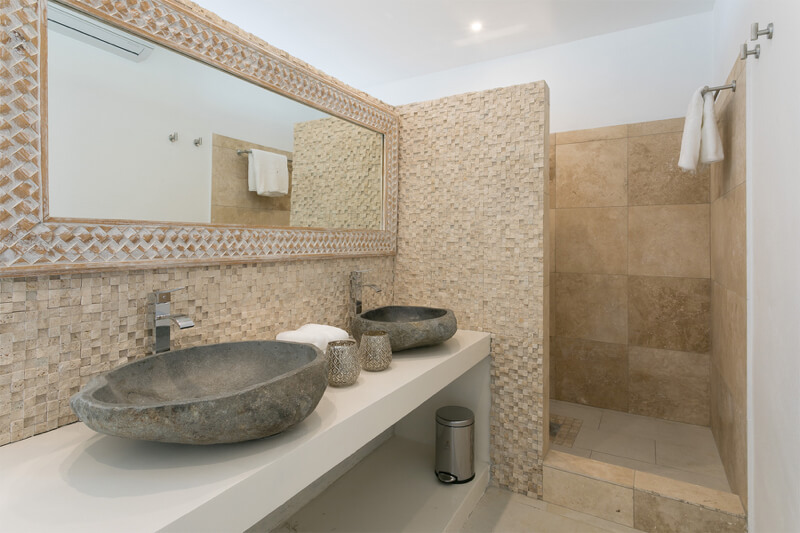 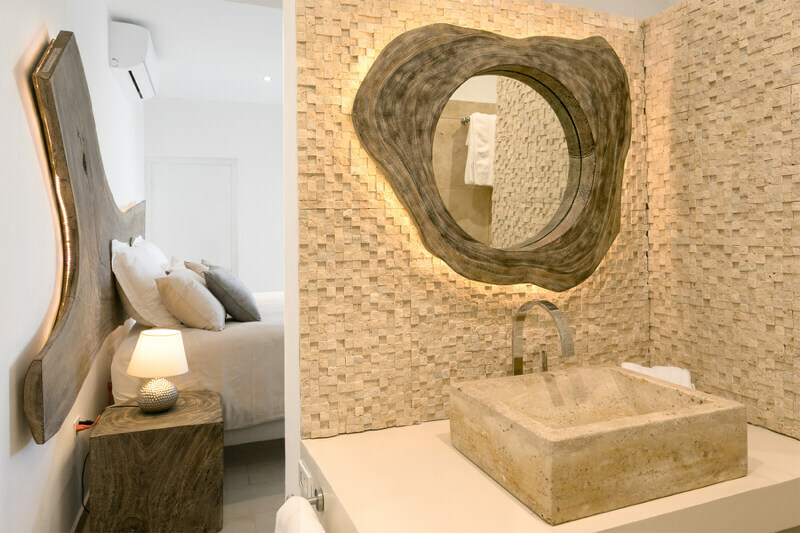 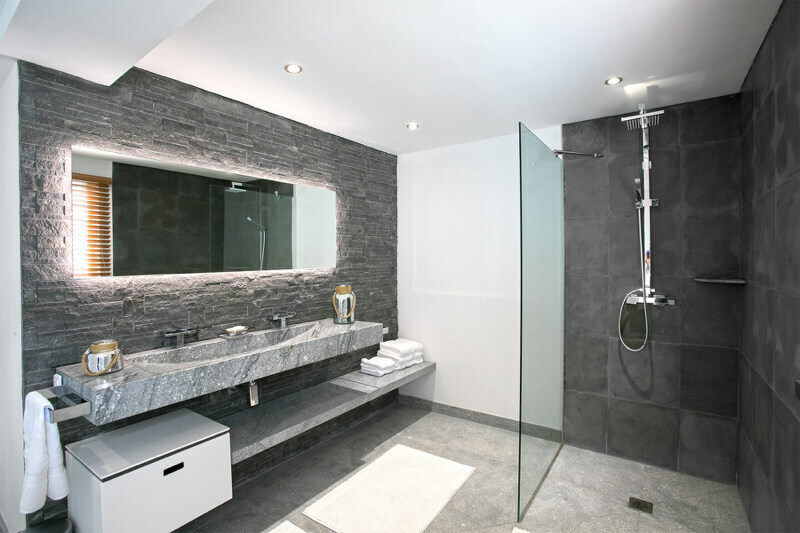 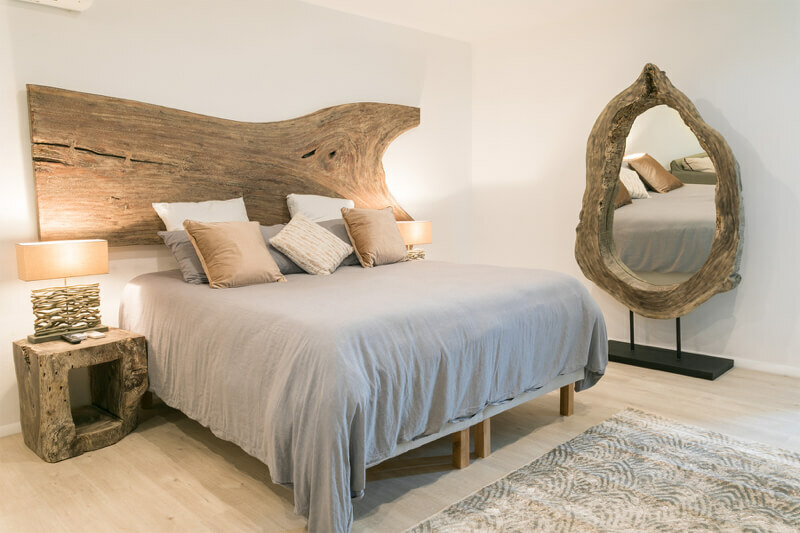 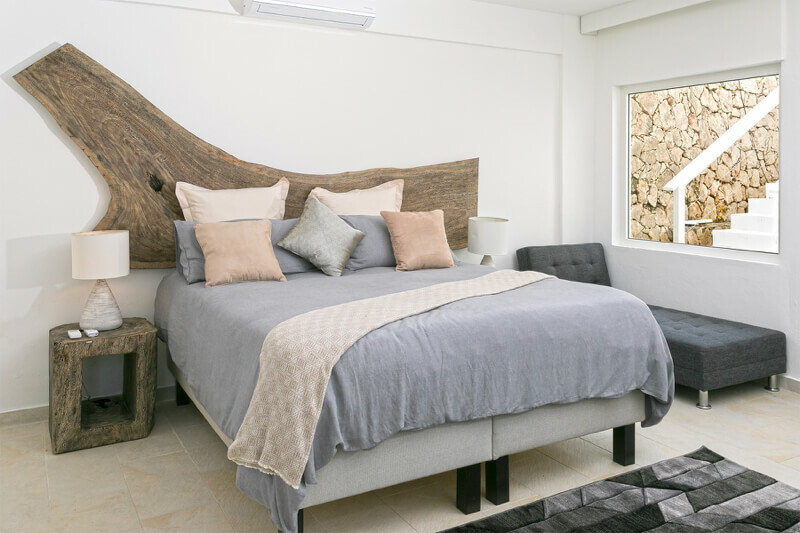 The air-conditioned bedrooms feature king-size beds, flat screen TVs and fabulous en-suite designer bathrooms with stone vanities and large open rain showers. 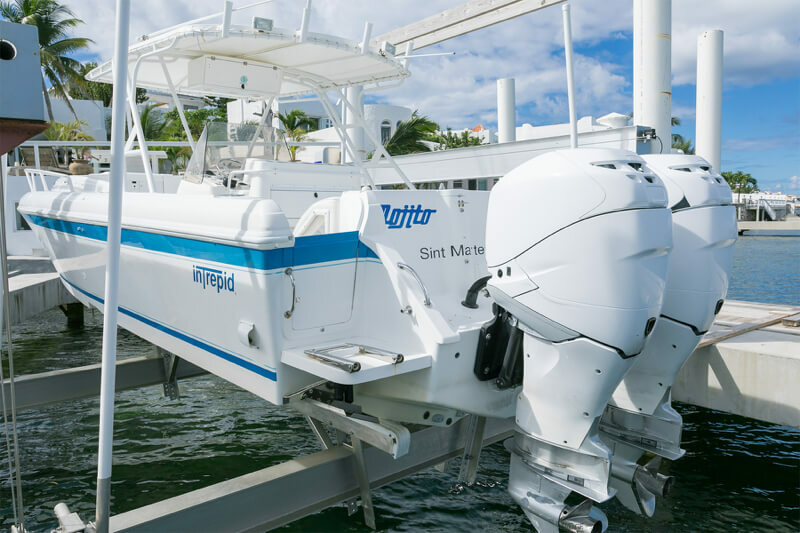 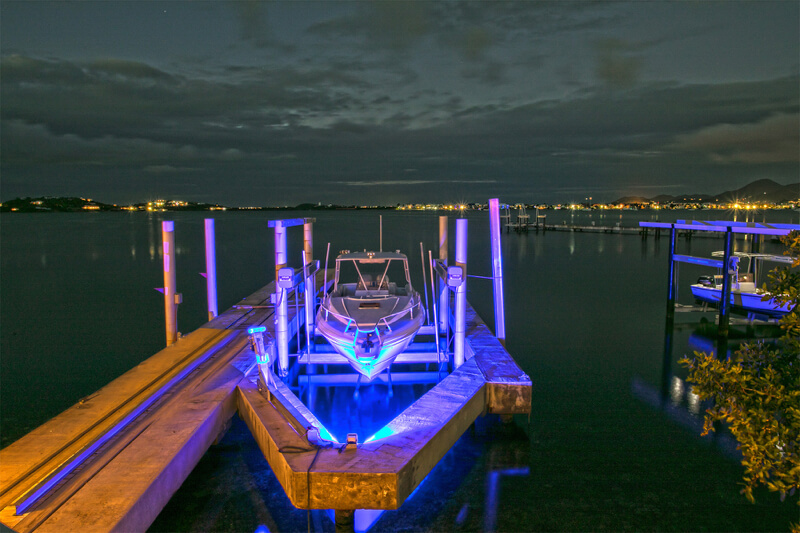 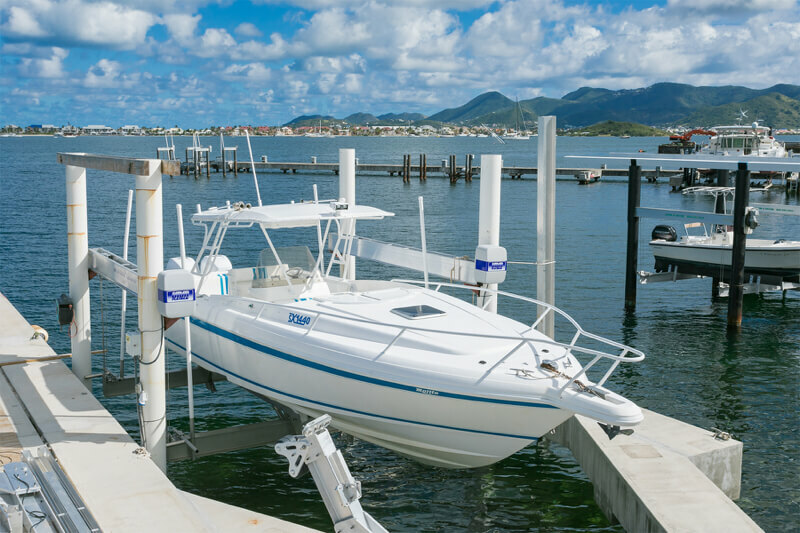 Blue Lagoon has its own boat slip and a boat that can be rented separately. 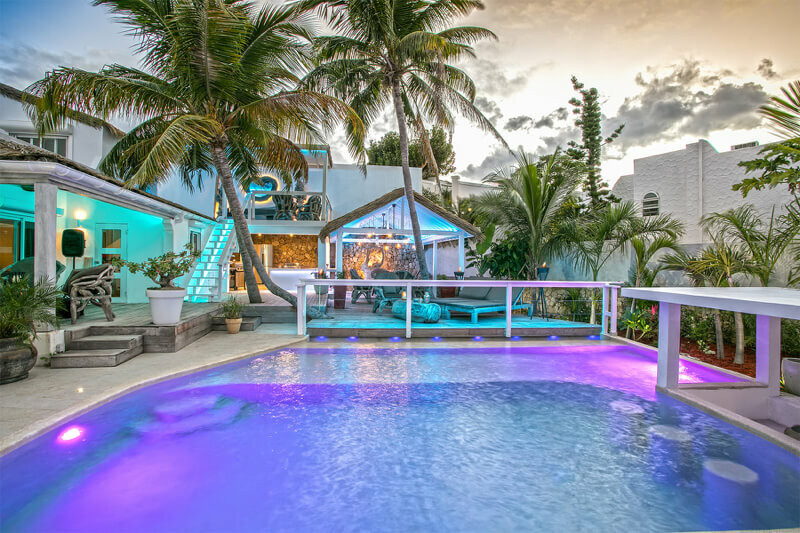 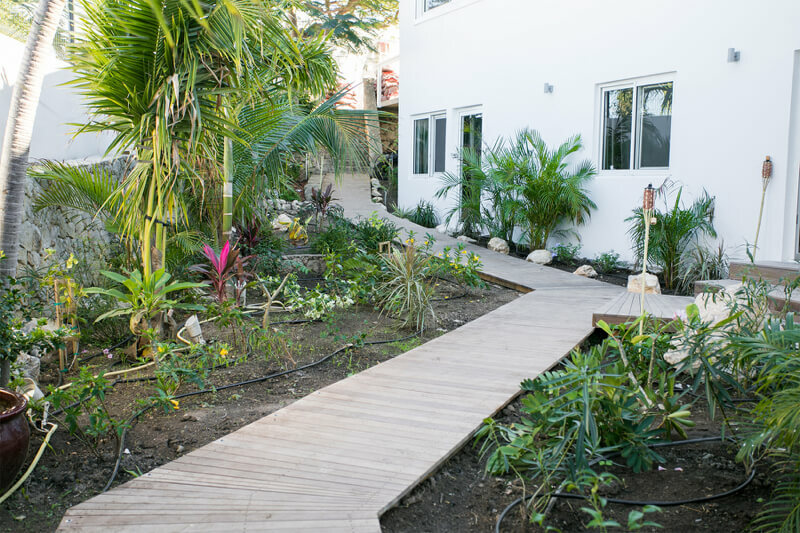 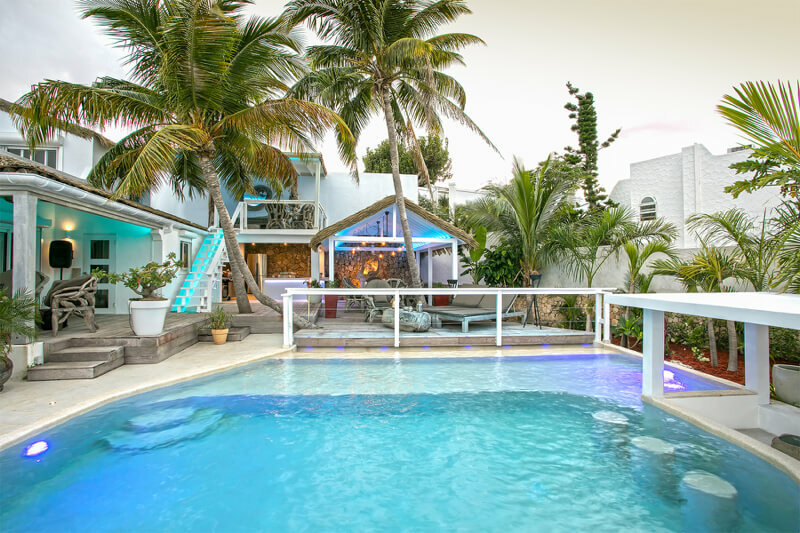 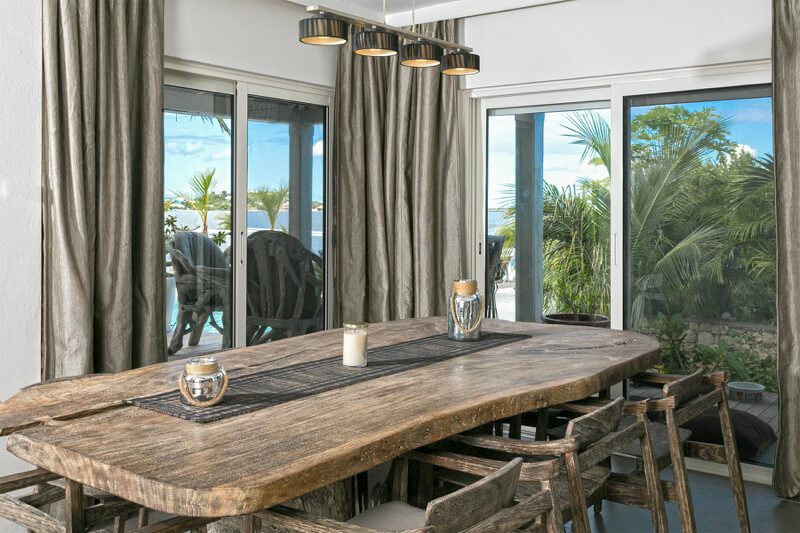 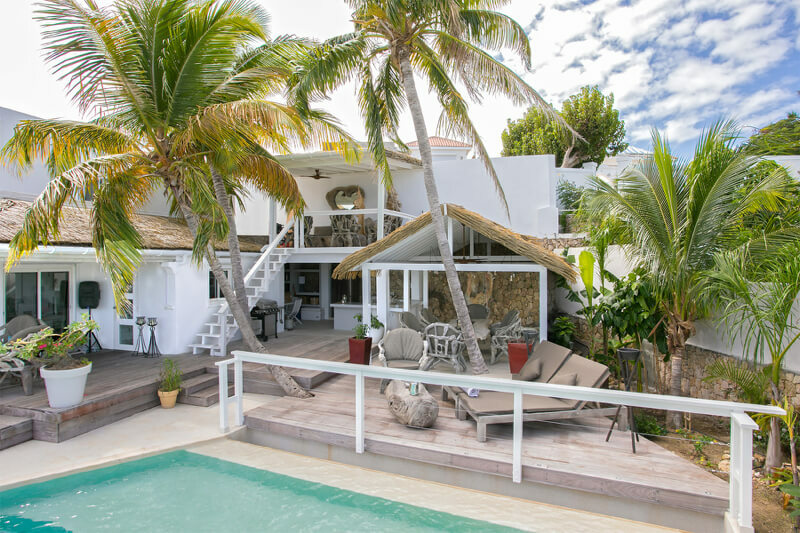 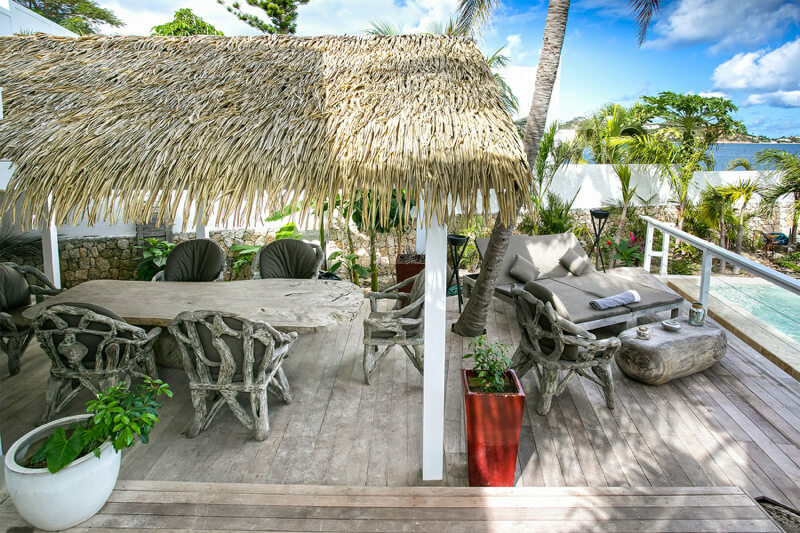 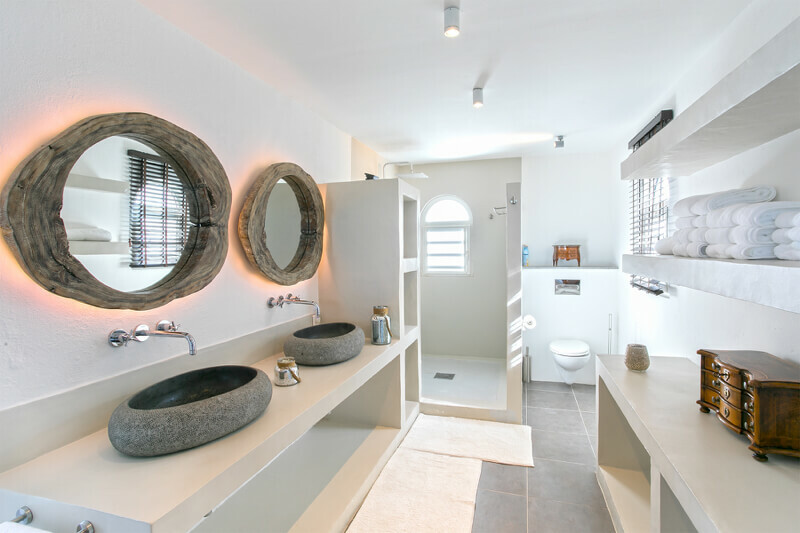 This beautiful property is just a few minutes drive from Maho, a popular area for nightlife with a casino, bars, and restaurants and home to St. Maarten’s famous beach located at the end of the airport runway. 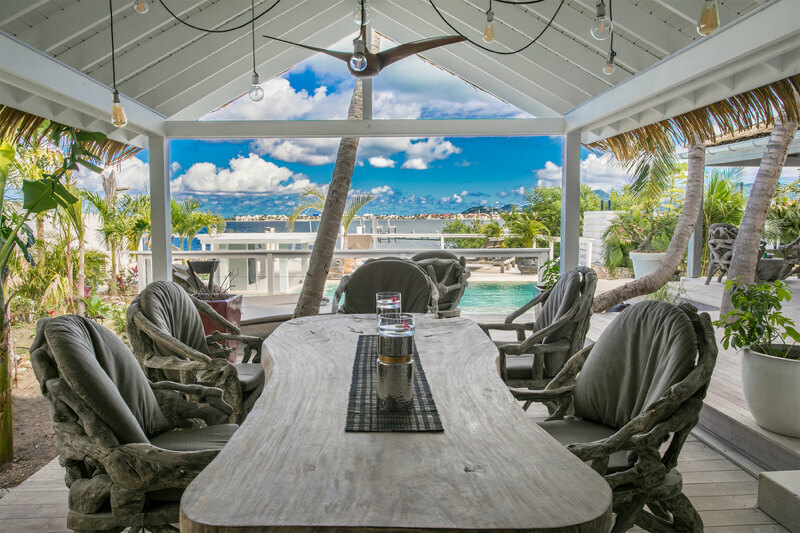 Watch the big jets land as they fly over the beach! 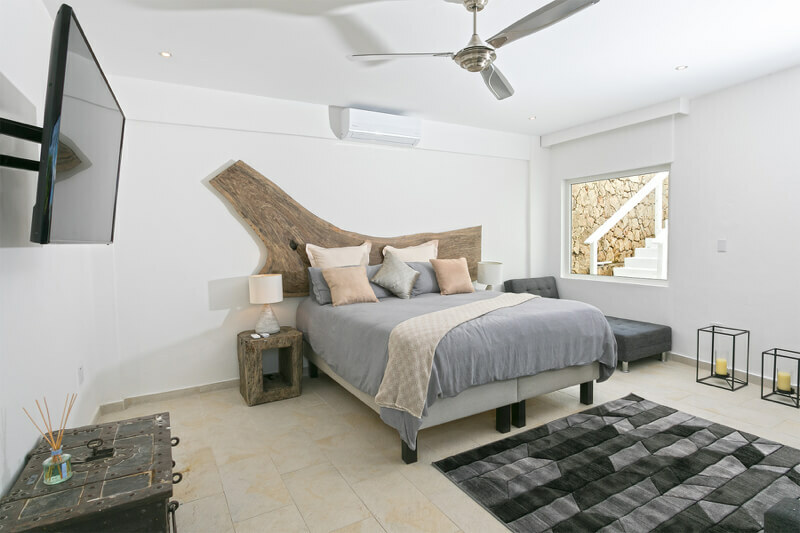 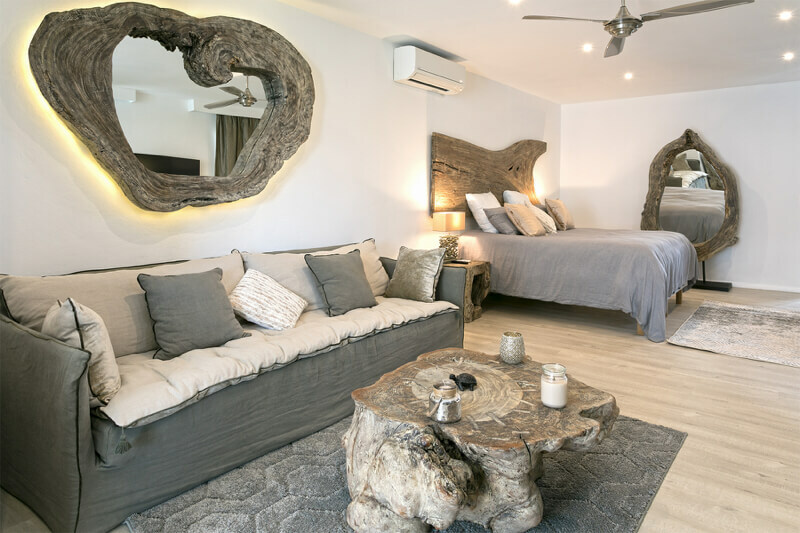 Five air-conditioned bedrooms with king-size beds, flat screen TVs and fabulous en-suite designer bathrooms with stone vanities and large open rain showers. 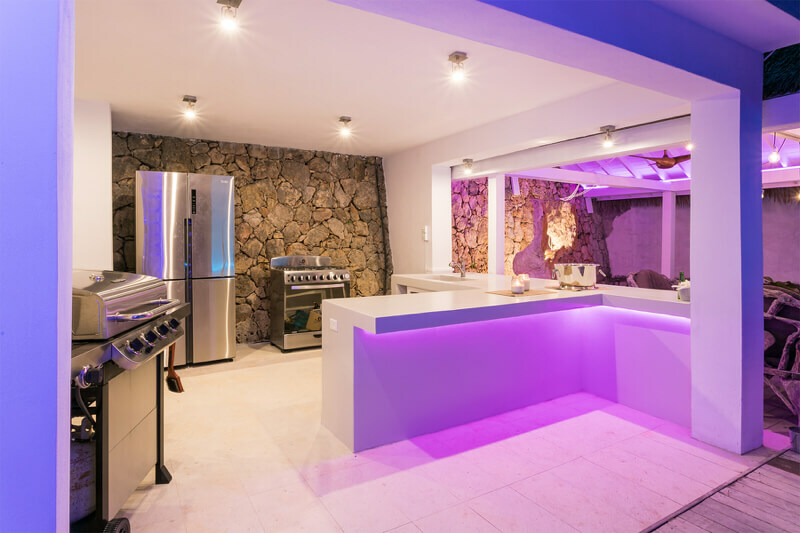 Air-conditioned sleek, fully equipped white kitchen with stainless steel appliances. 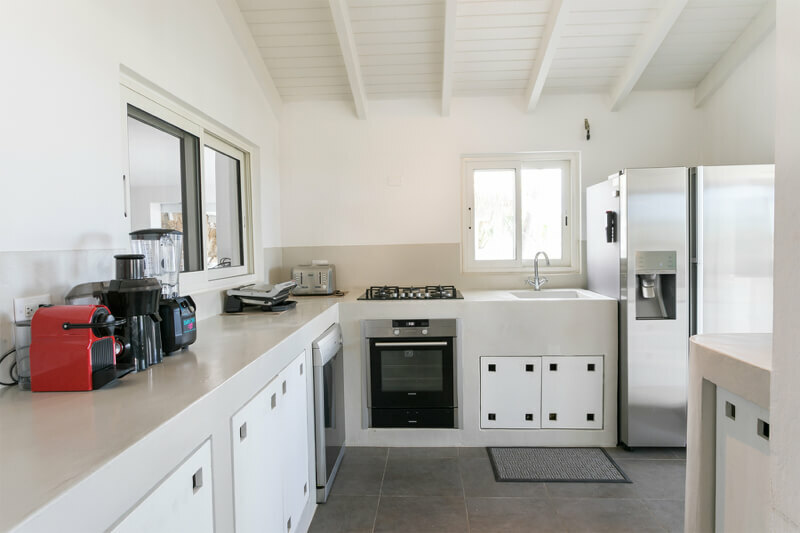 All is there to prepare a gourmet meal including a espresso machine, blender, microwave, blender, toaster, oven, large fridge with ice maker, dishwasher. 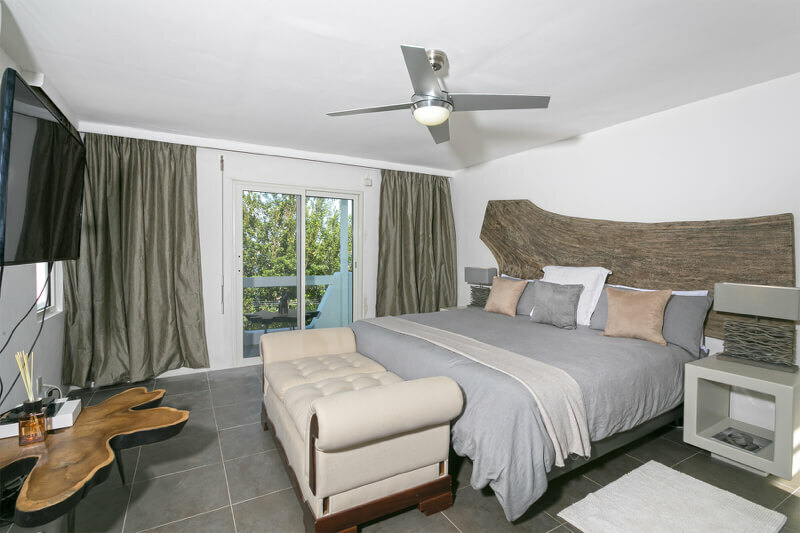 Air-conditioned living area with comfortable couches, TV and an indoor dining option. 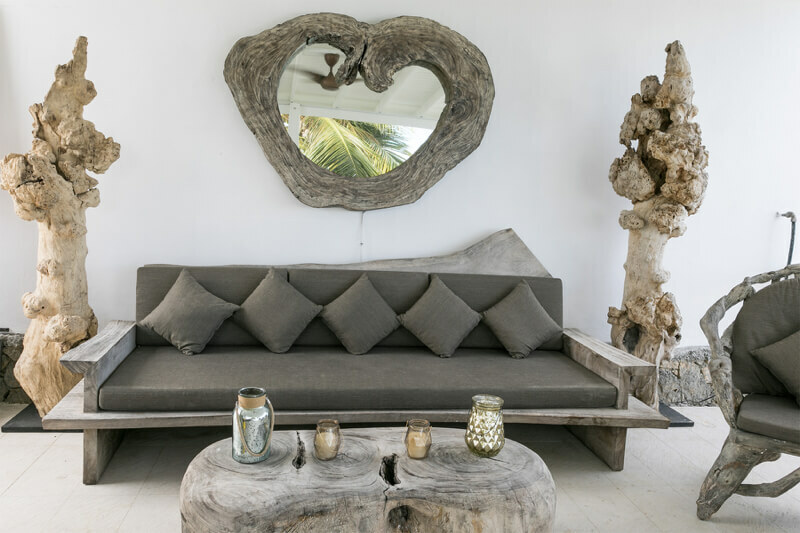 It offers beautiful wooden decor pieces.